Am Samstag habe ich den yard soweit fertig gebaut. Als nächstes folgt die Stromversorgung und der Ausleger auf AmericaN. 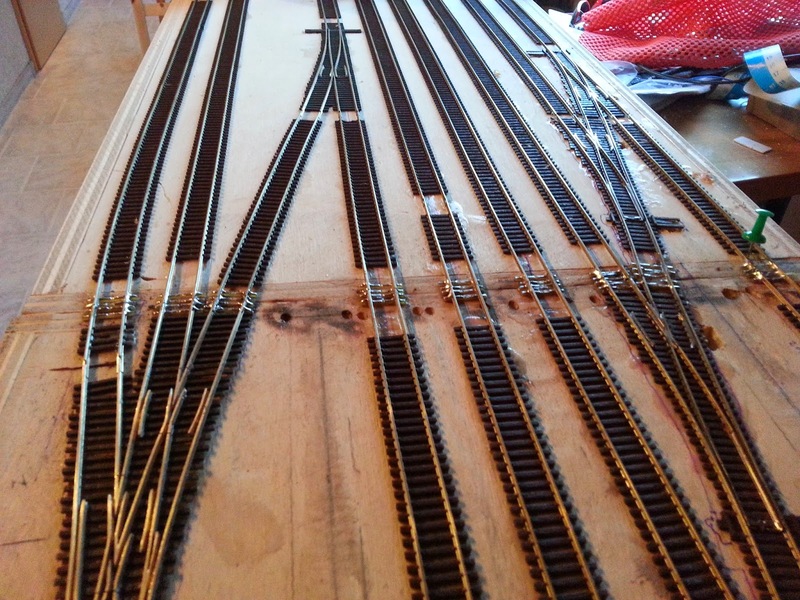 On Saturday I finished the track work. 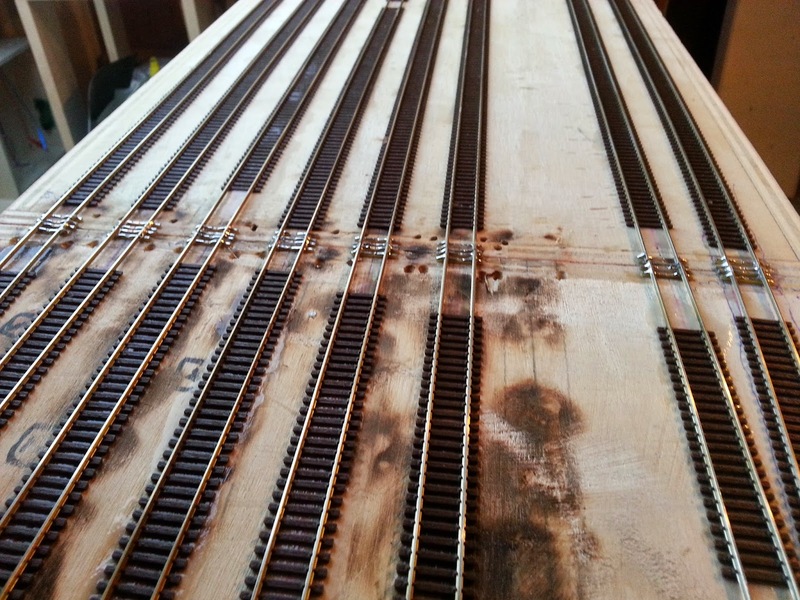 The next step will be wiring the modules and to build the AmericaN Standard module. Das 40cm breite und 90cm lange Anschlussmodul für den Übergang auf American wurde gebaut. Ich habe mit Flexgleisen mal den ungefähren Verlauf modelliert. 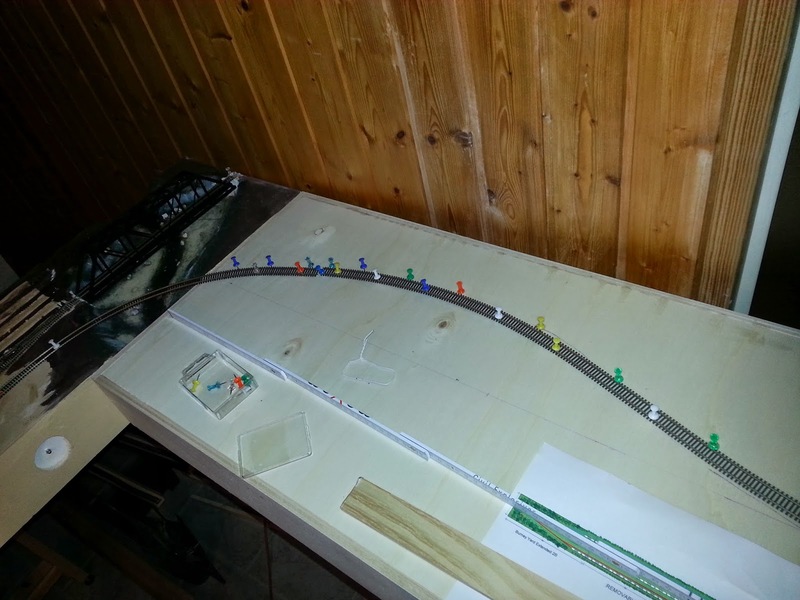 I built the 40cm wide and 90cm long connection module for the transition to AmericaN - Standard. I used some flex track to show the possible 50cm radius. Am Ende des Yards wurde die Dreiwegeweiche positioniert. At the ende of the yard I got the three way turn out in position. Die Gleise auf der westliche Seite des Yards sind ausgerichtet und aufgeklebt. Tracks an turn outs are aligned and glued on the western side of the yard. Die Gleisübergänge sind dank der 1mm breiten Kunststoffstreiben gut gelungen. Hier erkennt man auch gut die Aufteilung des Yards. 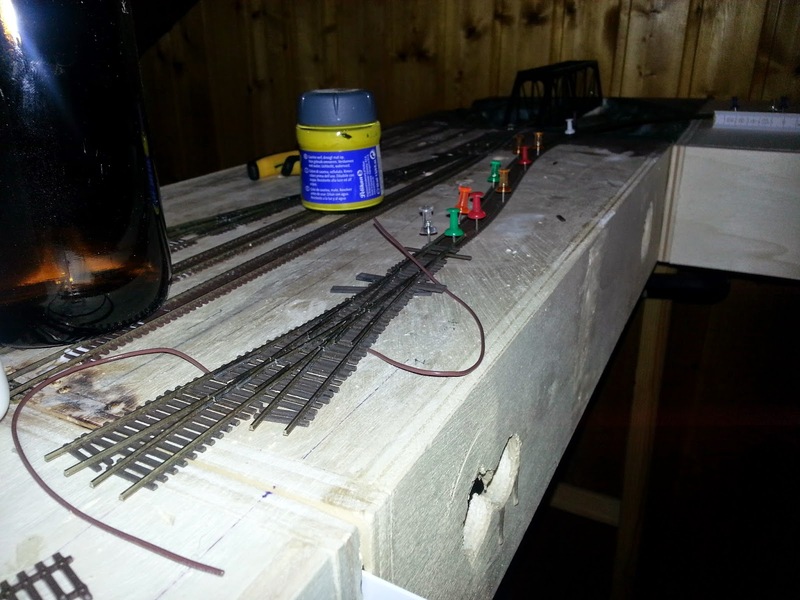 Links storage, Mitte main und Siding, Rechts interchangen. Themodule transition are automatically aligned because of the styrene spacers between the modules. 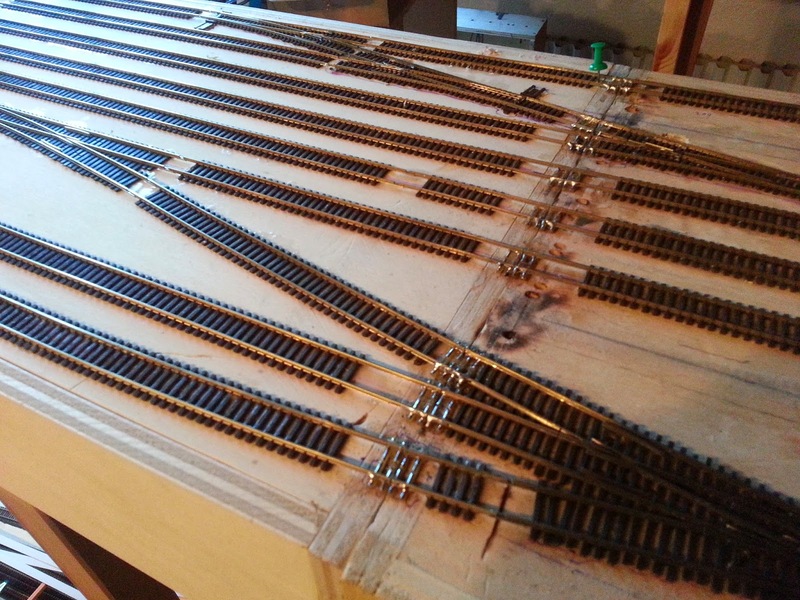 I cut the rails with a 0.5mm disc. 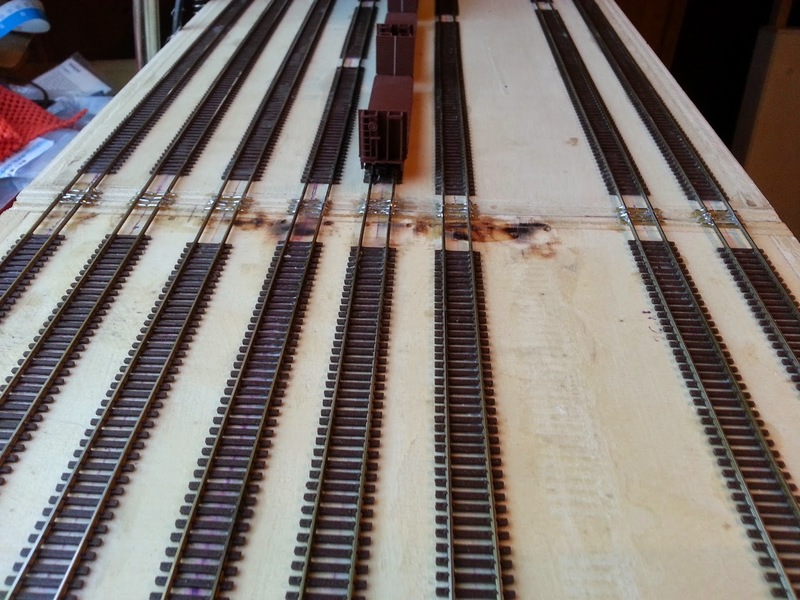 In the picture you can see the differnet yard sections: storage tracks on the left, main line with siding in the middle and the interchange track on the right. Die lange drei Wege Weiche bietet den Interchange tracks auf einen bypass für durchfahrende Züge. 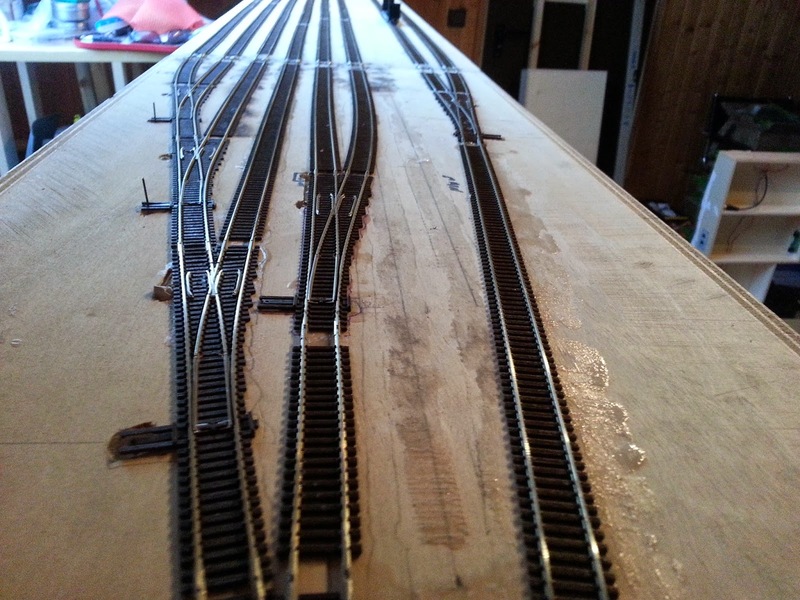 The long three way turn out gives the possibility to bypass the interchange tracks and directly move to the main.